Monozukuri is not only purely scientific but also a creative process in Japanese chain production. This concept also implies the expression of skill, spirit, passion, and pride in the ability to perform activities that produce the best quality products. The meaning of Monozukuri is not an unconscious repetition. It requires creative thinking associated with craftsmanship and craftsmanship. it’s philosophy is that the product is made not by machines but by humans, And it is important to create an environment where people can continually come up with new ideas as well as continually improve the production process. For those industries that face fierce competition on a global scale, human resource development is the single most important factor in ensuring long-term growth and the likelihood of success. enterprise. Under the instruction of lecturers from Hanoi Polytechnic University and the support from experienced experts from Toyota, Monozukuri has been focusing on providing and sharing information about the Manufacturing System. 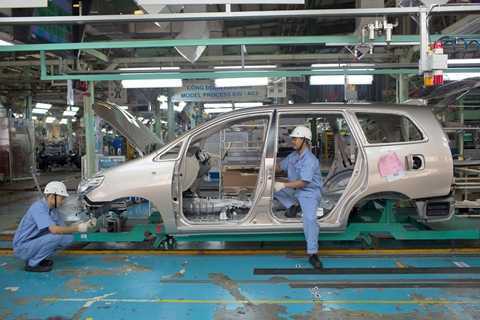 Toyota Production System (TPS), Waste Reduction and Non-Stop Improvement, Standard Work, Quality Management in Toyota Lean Manufacturing, and Positive Thinking in Problem Solving. The courses have been developed as participant-centered participants in group discussions, case studies, problem identification in the company’s daily production practice and Propose appropriate solutions, while the trainer acts as a mentor. In particular, participants in this course, not only trained theoretically but also instructed how to conduct improvement activities, visit the TMV plant & companies have deployed the deployment Successful TPS system to have a more realistic view of the knowledge gained in the course. Over 10 years of implementation, the program has built a team of 8 professional trainers, successfully organized 36 courses at HUT and TMV, for a total of 919 students, Of which 562 students are administrators of 119 enterprises nationwide, and more than 357 excellent students of engineering universities. 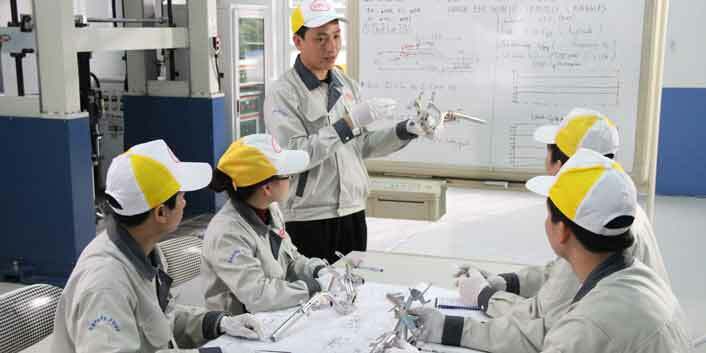 In addition to the courses, the Program has successfully implemented two Kaizen Showcase models at Vietnam Precision Industry Limited Company (VPIC1) and LeGroup Corporation, to help businesses respond. TPS is successful in its production and has made significant progress in its production and business operations. In particular, from 2016, in addition to traditional learning with lectures, classroom activities and factory visit activities, the course will focus on further enhancing practical knowledge of learners through content. Learn with games, for example, At the same time, organize visual study tours at each student enterprise. The course also extends the content of the lecture to focus on standard work knowledge, as well as additional knowledge of transportation and warehousing. The next Monozukuri course “Lean Manufacturing” is scheduled to take place in mid-May this year. Recently, Toyota Motor Vietnam (TMV), Toyota Vietnam Foundation (TVF) and Hanoi University of Technology (HUT) jointly held a workshop “Monozukuri 10 years in Vietnam”. The next Monozukuri course “Lean Manufacturing” is scheduled to take place in mid-May this year. Recently, Toyota Motor Vietnam (TMV), Toyota Vietnam Foundation (TVF) and Hanoi University of Technology (HUT) jointly held a workshop “Monozukuri 10 years in Vietnam”. The next Monozukuri course “Lean Manufacturing” is scheduled to take place in mid-May this year. 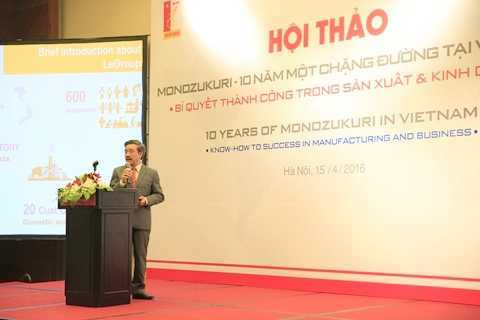 Recently, Toyota Motor Vietnam (TMV), Toyota Vietnam Foundation (TVF) and Hanoi University of Technology (HUT) jointly held a workshop “Monozukuri 10 years in Vietnam”. At the workshop, four companies participated in the course including: Vietnam Precision Industry Limited Company (VPIC1), LeGroup Manufacturing Trading Corporation, Song Cong Diesel Limited Company (DISOCO) and Vinh Hung Joint Venture Company (TMI Vietnam) shared the difficulties of production and business, as well as the results and achievements gained from the Monozukuri course. These companies have been applying Toyota Production System (TPS) into production and achieved considerable success. In fact, when applying 5S knowledge to reality, enterprises have improved production environment, reduced space, saving time and cost. Implementing standard work, using automated technology and streamlining production helps businesses increase productivity.